$2.69 to $139.99 & FREE Shipping on orders over $59 $35. 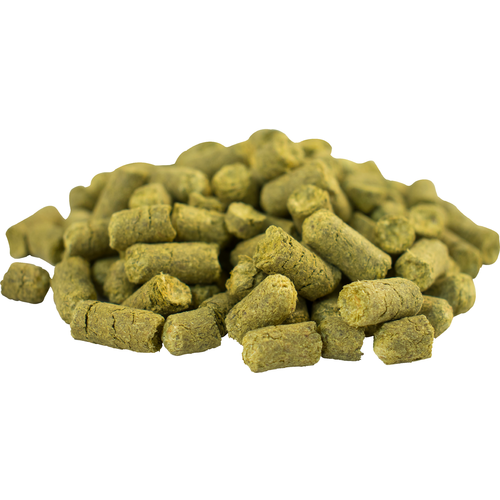 El Dorado hops are utilizied for their high alpha bittering characteristics and are best known for a sweet, candy-like aroma. Strong bittering and aromatic notes of cherry and mango compliment everything from IPAs to Pale Ales and Wheats. Grown in the Moxee Valley, a sub region of Yakima Valley, Washington. shopped a few sites, best price! The transfer of its yellow hop particles to the beer. Great price for a great hop! My brother used this hop in his last IPA. Love the candy fruit flavor it imparts! I shopped a few sites for the best price with shipping. MoreBeer had the best price. Product is as expected. Mosaic, citra, galaxy. Great hops. But they get better paired with ElDorado. The candy and pineapple notes are nice enhancers in hazy ipa style beers. Eldorado has to be my favorite hop, I frequently get blueberry flavors out of it in my brews. Fantastic hop and great service from Morebeer! Thanks! The hops were fresh and had a nice pungent aroma of citrus/tangerine orange smell. The flavor profile from the 30 minute hop stand was delicious sweet orange without any pithy or astringent bitterness. I love this hop variety! Used as the sole hop it in an IPA with a simple grain bill and it turned out incredible. However, the aa% was lower that anticipated at 9.02% so I had to use all 8oz in a batch to hit my targets. Keep this in mind! When ordering hops without specific info on your package, round up. Other than that I figure it's a good deal, price was good. Will buy more. Big fan of El Dorado! Just used El Dorado hops for the first time in an Brown IPA, and was very pleased w/the end result. Strong stone fruit (cherries), and candy aroma. I used for aroma/flavor, and also dry hopped. I made a Single Hop Belgian IPA using El Dorado Hops and it turned out really great. This kind of hops has great taste and smells wonderful. I would most definitely recommend them. I've been hooked on this Hop ever since trying Flying Dog's Single Hop Double IPA brewed with El Dorado. I purchased 4 oz of this hop through MoreBeer, and have so far been impressed. I've used it for dry hopping, as well as for creating single hop beers. It gives a nice big pear flavor, with hints of watermelon and cantaloupe. The aroma is of sweet candy with hints of grass. It is high in alpha acids, but not aggressive as other hops with it's bitterness.